The general interpretation of politics in the People’s Republic of China is that the country has a “One Party, Two Factions System.” One faction, associated with Hu Yaobang, Zhou Ziyang and Hu Jintao, Wen Jiaobao, is sometimes known as the “Youth League Faction,” as several prominent members got their political start in the Chinese Communist Youth League. Another faction is sometimes known as the “Shanghai Clique,” and famously included Jiang Zemin and Zhu Rongji. Both factions are considered to differ little in substance, and even differences in personality (Hu Yaobang’s public reputation was as a Joe Biden, affable, given to gaffes, and temperamentally incapable of conducting a conspiracy, while Zhu Rongji enjoyed a similar mix of admiration with a sense of being out-of-touch that was experienced by George H.W. Bush). The main difference is often suspected to be evidence that even when an almost identical ideology is shared by all main players (pro-growth, pro-investment, pro-authoritarianism), factional politics necessarily emerges. The same general consensus argues that following the rise of Deng Xiaoping, the radicals and beneficiaries of the Cultural Revolution were peacefully marginalized. Instead, Deng surrounded himself with pro-western liberals now associated with the Youth League Faction (Hu Yaobang, Zhao Ziyang) and authoritarian conservatives (Li Xianian, Li Peng). After the Tiananmen crisis, Deng Xiaopeng (according to the received view) first tilted authoritarian in 1989 (to stabilize the country) and then began his famous Southern Tour in 2002 (to re-start ecnomic growth). Also, in 1989, Deng Xiaoping began elevating the pro-growth authoritarians of the Shanghai Clique. The consistent gains of economic growth under the Youth League Faction of the 1980s and Shanghai Clique, and the purging of the more radical liberals and conservatives, thus lead to the current Beijing Consensus. The accelerating economic growth of the Deng and post-Deng eras (with the exception of the 1989-1992 Tiananmen Interlude) has led to widespread reduction of poverty, the creation of ‘world cities’ in Shanghai and Beijing, and a style of economic growth closely modeled on that of Taiwan. Capitalism with Chinese Characteristics by Yasheng Huang argues there is no Beijing consensus, and that the policy differences between the Shanghai Clique and the Youth League Faction are at least as large as those between Indira Gandhi and Manmohan Sing. The economic policy of the People’s Republic during the 1990s era (when the Shanghai Clique was ascendant) was almost identical to that criticized in The Other Path by Hernando de Soto: based on large scale Foreign Direct Investment (FDI) and profoundly hostile to indigenous businesses. The most surprising sections of the book deal with Shanghai, widely considered the more advanced city in China. Capitalism with Chinese Characteristics instead argues that Shanghai is one of the most backwards cities in China. Whether though income from individual businesses, or number of patents, or individual income as a share of GDP per capita, Shanghai is near the bottom of the barrel. Instead of being an economic dynamo, Yasheng Huang presents Shanghai as a kind of neo-Soviet parasite city: devouring wealth in order to pay for grand infrastructure projects while actively routing out entrepreneurial drive. Shanghai, in this view, is not a shiny city: it is just another rest belt town with better PR for tourists. Xiushui Market was a thriving outdoor market fair, located not far from the US Embassy. It started spontaneously in 1985 when a few traders began to sell fruits and vegetables…Without any input from those merchants who actually created the value of the Xiushui brand and without an explanation on the choice of the entrepreneur to build the new market, Chaoyang district government arbitrarily assigned control of this very valuable asset ot an outsider… In essence the original Xiushui merchants were paying the market price for the right to the brand they themselves had created… the brand was completely expropriated from them. The rise of Shanghai has been accompanied by a collapse in rural education and health care. China’s illiteracy rate increased 5% during the era of the Shanghai Clique. Inflation was consistently high, while the nominal definition of poor fell consistently during the Clique’s reign. While Youth League leadership before and afterward increased real rural incomes and welfare, Shanghai leadership decreased it. Youth League leadership allowed privately owned companies in rural areas (called Township and Village Enterprises) to spring up. These were crushed by the Shanghai Clique. High-level politics in modern China is often compared to spats between country-club Republicans. Instead, Capitalism with Chinese Characteristics presents the political fight between the Youth League Faction and the Shanghai Clique as similar to between the Club for Growth and the Industrial Policy wing of the Democratic Party — both may be active in politics and want year-over-year increase in GDP, but their desired outcomes are far different. 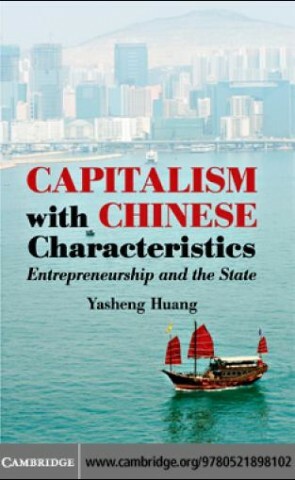 Capitalism with Chinese Characteristics, like Zhou Enlai: Last Perfect Revolution and Zhao Ziyang: Prisoner of the StateCapitalism with Chinese Characteristics, was written by a Chinese-educated intellectual with access to material that had not been seen by Western academics before. Some of the arguments (that TVEs were private-sector entities, for example) go against the received wisdom, but the sources for these claims is well documented. Capitalism with Chinese Characteristics is a challenging book, both in its academic writing style and the topsy-turvey consequences it has for viewing the Chinese economy since the rise of Deng Xiaoping. Highly recommended. I read it on Kindle for iPad.